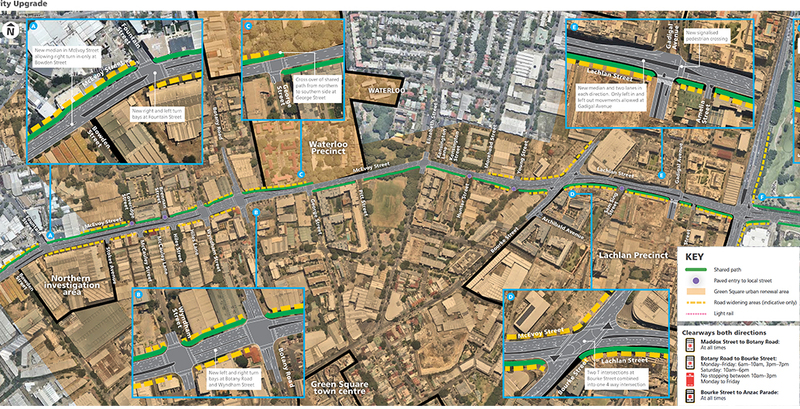 Touted as road improvements to “reduce travel time, improve connectivity and support urban renewal” current plans for the southern fringe of Sydney continue a pattern of dividing urban communities with ever more congested roads. The NSW Government is planning what it calls ‘road improvements’ in the inner city suburbs of Alexandria, Waterloo and Moore Park in Sydney. Their stated intent is to “improve traffic flow and facilities for pedestrians and cyclists in one of the city’s fastest growing precincts”. 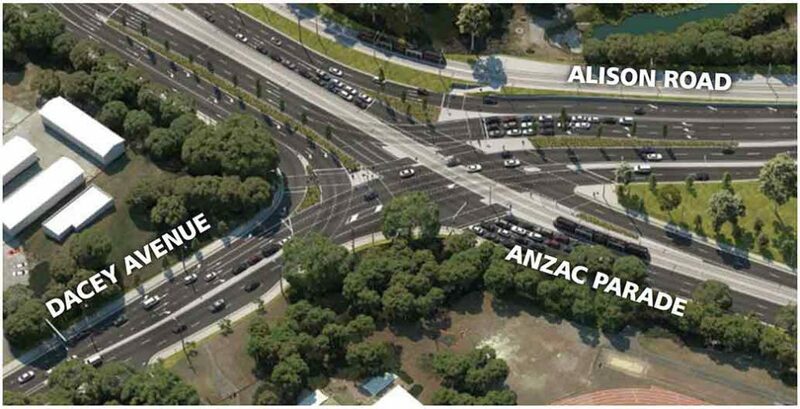 However, the plan, what is now called the Alexandria-Moore Park Connector, seemingly proposes the opposite: a set of road widenings that will undoubtedly attract additional vehicles to a connected sequence of roads, which includes Euston Road, McEvoy Street, Lachlan Street, Dacey Avenue and Allison Road. Taken together, this would appear to be less of an improvement to the pedestrian experience, and rather, an alternative route for traffic from the M5 to cut across to the M1 Eastern Distributor. This plan will create a shorter path between these two motorways. Introducing ‘continuous flow intersections’ along this path will make these roads faster. But it will attract yet more traffic. These are busy roads already and are hardly pleasant to walk along or across. Signals are spaced for cars, which don’t stop for people trying to cross in the gaps between them. So while these changes are collectively called the Alexandria to Moore Park Connector, they are better thought of as a disconnector. They improve vehicular connection across these roads, from east to west, while disconnecting the neighbourhoods through which the roads traverse. Thanks to the mostly residential re-development in and around Green Square and Alexandria, bringing with them tens of thousands of new residents, these once isolated neighbourhoods have the opportunity to become one continuous urban community. Yet these road changes work against such opportunities. McEvoy for instance, is a nascent High Street, supporting food markets, restaurants and a good collection of clothing stores, particularly between Fountain Street and Botany Road. But it needs help. Not to make the road wider, so that cars can speed through, but to make it narrower, so people on foot can cross to and from the shopping strips on either side of the road. People should be able to cross these streets freely and without fear. McEvoy should be a destination, not a detour. In other words, this area should be moved down, rather than up the hierarchy of roads. Meanwhile the State Government downplays these negative traffic impacts on the community, insisting the changes will “support urban renewal along the corridor, and encourage motorists to use alternate routes away from the CBD”. But one only has to scrutinise the map of road upgrades to see how the impact of these works will have the opposite effect. Look at all those lane widenings! Each and every widening means pedestrians will have to walk farther across the street. With a minimum of green time, this will hardly be an improvement. Presumably what few street trees there are will be destroyed to promote the movement of cars, reducing the quality of the walking environment. While shared paths improve conditions for bicyclists when compared to no bike lanes and no shared paths, it is hardly best practice. Lumping together cycling, walking and other uses of the footpath does not constitute an improvement for pedestrians, compared to a genuine third path. Then look at the traffic forecast, which is claimed will increase by 50 percent in four years. Such increases do not happen by themselves. Rather, if it happens, it is likely the result of a project billed to relieve congestion – WestConnex, for example. Undoubtedly some will be travelling faster, but not pedestrians nor cyclists in the earmarked neighbourhoods. The uptick in Sydney’s traffic forecast is still up for debate. My research in America has found that these forecasts are not generally terribly accurate. I would be surprised to find different in Australia. If roads are indeed at capacity for a period of time, then the flow through them cannot increase during that time, which is the meaning of capacity. Traffic is self-regulating, the slower the travel speed, the lower the demand. The faster the speed, the higher the demand, this, in turn, creates congestion, which lowers speed until a new equilibrium is found. This demonstrates the concept of induced demand. Expanding urban roads induces new traffic but this in of itself is not necessarily bad. In particular, it can mean increased mobility into urban areas from suburbs and rural locations. But it comes at a cost. More cars means more road danger, more pedestrian and bicyclist injuries, more air pollution, longer distances across streets for pedestrians, and a less pleasant neighbourhood. The City of Sydney struggles with controlling traffic and congestion, evidenced in new proposals for traffic calming responses in Alexandria. While these mitigating measures might be the best that can be done, (assuming the road proceeds), it is better still to stop the project in its tracks. This kind of urban road expansion is straight out of the 1950s. It does not befit a city with a rising transit mode share (and flat to declining vehicle travel). Changes like the Alexandria to Moore Park Connectivity Upgrade need to be resisted. This article was originally published in WalkSydney, here.